Polyethylene Foam Tapes combine a rubber-based adhesive with a conformable closed cell foam. The rubber based adhesive provides a good initial bond to a variety of surfaces. 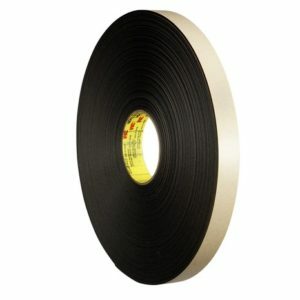 Polyethylene Foam Tape is available in a variety of widths and thicknesses. Polyethylene Foam Tape can be supplied in White or Black with adhesive on one side or both sides to meet your specific application needs. Polyethylene foam tapes are ideal for joining, mounting, sealing and gaskets. Typical applications for Polyethylene foam tape are POP displays, nameplates, sign or wire and cable mounting clips. The increased demand for foam tape often needs special fabrication. Can-Do Tape is here to provide custom slit and custom fabrication to any foam application. Polyethylene (PE) foam, is a semi-rigid, closed-cell type of foam that is a chemically crosslinked polyethylene foam. It offers excellent protection and durability, is reusable and 100% recyclable and is the most common plastic polymer. It has a near-infinite amount of applications due to having a high load-bearing capacity. Polyethylene foam is ideally suited for indoor applications requiring shock absorption, insulation, cushioning, vibration and sound dampings such as in the packaging, aerospace, floatation, recreation, construction, and appliance industries. Polyethylene foam is a strong, resilient closed-cell foam. PE foam is ideally suited to a material or product requiring a shock absorption, insulation, dampening, barrier or as a buoyancy component. It is a material often used for cushioning products in packaging solutions. Polyethylene foam’s excellent buoyancy allows it to be used in flotation equipment and other nautical products. Polyethylene foam can withstand significant amounts of pressure and will not lose its original foam properties which makes it an ideal foam for solutions where support & durability are necessary. PE foam provides a clean, smooth finished look after custom fabrication and is available in several colors and densities, as well as anti-static, anti-microbial, conductive and electrostatic dissipative. PE foam can also be available in low abrasion and cross-link forms. The structure of PE foam is neither entirely solid nor empty and is produced via a three-step extrusion process (mixing, expansion & cooling). Polyethylene (PE) foam can be manufactured to produce a large selection of materials depending on the need for comfort, support and/or durability. It is during the manufacturing process that the flame retardant additives can be introduced into the foam to meet different fire codes, as well as provide anti-microbial, anti-static, conductive or electrostatic dissipative additives. Product protection against surface abrasion, edges, and corners. The Production and fabrication of mats. Thanks to P Whiting for a nice video on Polyethylene.